/ The Four End Time Groups: Will You Be in the Safe Group? At this point you probably see the problem I did. The 144,000 are the only ones mentioned as protected while these earthquakes, meteorites, asteroids, fires, and tsunamis smite the entire earth (Rev 6:12-8:13). Since there are maybe 2.5 billion Christians alive today, 144,000 seemed like a ridiculously small number of people to receive God's protection. How could only 144,000 of those “with the faith/testimony of Jesus” (Rev 12:17=14:12) be protected by God? Common misconception: Some Christians fear that they can be effectively added to this group accidentally or without their knowledge or permission (much like “friends” can do to us on Facebook). But if you read Revelation 13, a much different picture emerges. The mark is put out by the False Prophet as part of the required worship of the Beast and his image. When you have it, you can buy and sell. When you don't, you cannot. Therefore, it will not be something you do not know you have or do not know about in advance. In fact, there appears to be a plan to torture people who refuse to take it, something that would be wholly unnecessary if the mark could be slapped on people without their consent. Once the Beast comes to power, people will have only two options: die or comply. The preferable option of escape will be gone once the mark is released. As I explained in a previous article, once you see the mark, it will be too late. You will have to either compromise your principles and take the mark despite you knowing it is wrong, or to face your death as a martyr. The Woman starts out in the sky as a clear representation of the constellation Virgo, or the Virgin. 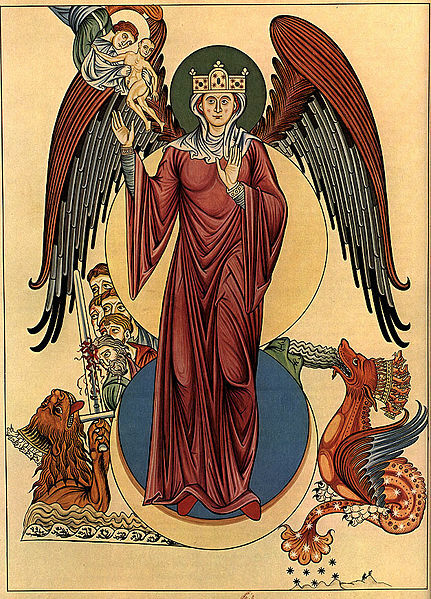 The moon and twelve stars at her feet (and her birth of the obvious Messiah man-child) identify her as the righteous of Israel per Joseph's dream of his family (Gen 37:9-10=Rev 12:1). The other reason for this sky scene is because it may be depicting exactly what was in the sky when the Messiah was born. Further, bearing out this principle, we read in Joel that "and everyone who calls upon the name of Yahweh [Yehovah] shall be saved for there will be an escape for those in Mount Zion" (Joel 2:32 HCSB). 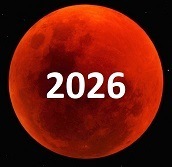 Joel's prophecy of the moon turning to blood is a parallel of the 6th seal blood moon event (Joel 2:31=Rev 6:12), caused when planet Wormwood begins to terrorize the earth. Since this threat comes before the Tribulation threat, obviously there would be no Woman left if she was not included in "everyone calling on God" who is protected in Israel. If God plans to protect all those who rely on God from Wormwood, then it makes no sense that he would not do the very same thing for them from the Antichrist threat that follows. It's going to take faith to obey God and leave our homes for the faraway safe place of the Woman. It probably will not even look like it's a good idea to go or a good place to go to at the time, much like the Promised Land looked at first to most of the twelve spies (due to the giants there). If we live by trust that God is there and wanting to reward us for seeking him (Heb 11:6) then that faith muscle will be built up and ready for the leap of faith needed to escape Wormwood and the Mark of the Beast. Hi Ian Israel is literal Jews because prophecy says so. Where in bible prophecy does it say the Jews who are there “now” are the true Hebrew Israelites? Why does revelations say they are not? Francis, See Are Israel’s Jews Fake, Khazar or Edomite Jews? for the proof Israel today is true Judah. Revelation 3’s letters you are quoting talk about people in the church back in the early centuries who say they are Jews and are not. It also has a mention of those who say they are apostles and are not. Well first it was about people long ago, not today. Secondly, Jews of Israel today are not believers in the church anyway or trying to be. Mostly they don’t believe. So Revelation is just not talking about Israel when it says those who say they are Jews and are not, yes? George, Are you saying the 10 northern tribes that inhabit the Christians nations of today, are all Caucasians? 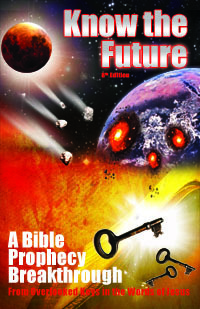 So, if I am understanding your article, you do not see a rapture of the church before the tribulation begins? It makes me wonder how we are to know that the tribulation has indeed begun. I was raised to believe in the rapture first, but to say I don’t know everything is an understatement. Also, I have always believed that the 144,000 were actual Jews who would come to know Yeshua (Jesus) as the true Messiah. 12,000 from each tribe… thoughts??? I do appreciate what you say about the signs in the heavens. A person could make anything fit…. In 2012 the world was freaking out about the end of the Mayan calendar. Aly, yes, according to Jesus and Paul, the rapture comes “after the tribulation of those days” (Mt 24:29). Look at my rapture articles below for more on that. Knowing when the Tribulation begins is not the problem as “Elijah comes first” (Mark 9:12) and warn the world (Mal 4:5). Yes, the 144,000 are actual Israelites, only 24,000 of which could be technically called Jews. Thank you for these thought provoking writings. I’m struggling (and have for years!) with ‘how to love’… So much so that my heart literally aches! What is this ‘love your neighbor as yourself’ really look like in action? Does it mean to become a doormat and never being argumentative … or to just accept the wrong people do and offer no counsel? I have in the past, reached out to you in regards to my daughter – thank you… though I have since forgotten your words. Sorry. Sherry, Love includes loving boundaries, yes, when people wrong you. What it looks like is a big question, did you see my latest article on the four warnings of Jesus where I give more examples? But in the example of your daughter, to reject her as other Christians say is not love. She has a different religion than you, that does not make her unlovable. Jesus accepted everyone even the people in his day with a different religion: the pharisees. He even ate with them. Seeking peace with your daughter is loving your maker. He does not say to hate Muslims. Christians say that, but not God. He says to love them, even if you consider them enemies as many Christians do. Can you please explain the scripture to me that says Luke 21:34-37 But take heed to yourselves, lest your hearts be weighed down with carousing, drunkenness, and cares of this life, and that day come on you unexpectedly. For it will come as a snare on all those who dwell on the face of the whole earth. Watch therefore, and pray always that you may be counted worthy to escape all these things that will come to pass, and to stand before the Son of Man. Tracey, I have this article on how Lk 21:36 verse has two readings and it’s important to read the better one to understand. Once you read that, then read this to understand why you need strength to escape (no pretrib rapture, but escape on earth). These “articles” are VERY thought provoking! As you mentioned, “end times” study is difficult. I really appreciate your hard work and studies that you share. My question is, Where does it say we will be tortured for NOT taking the mark of the beast. I was under the impression the torture and beheading stuff came from refusing to “worship” the beast. The mark had to be taken willingly. I LEAN toward the -smart phone credit card- scenario as the coming “mark”! (always in your” hand” , taken willingly and capitulating to be able to buy and sell “head”). That takes into account our new dependency on the recent “electronic cyber cloud permanent record keeping and of world super computers and individual access to this technology. Abe, taking the mark and worshiping the Beast/Antichrist are made equivalent in Rev 13 (Rev 13:15=Rev 13:16). You die if you refuse either, and you won’t be alive to worship the Beast without the mark. But yes, you must consent to the mark, they can’t just put it on you against your will…but that doesn’t mean they can’t torture you. That the torturing (but not murdering, at least not at first in an attempt to get the most marked people possible) locusts commence at the same time as the Great Tribulation and the introduction of the mark tells me that their job is to find every person and compel them through pain to take the mark. Joel even describes these same locusts as able to find and break into every hideout (Joel 2:3,5,9). Five months later (Rev 9:5), they have everyone found and marked or killed by beheading (Rev 20:4). See this article for more. Whatever the mark is, it’s not here yet and when it does come, we won’t get to see it because God will have us safely in Jordan by then. Debbie, no, the mark is not anything not tied to worship of the Beast who is not here yet. Don’t fear chips or cards or anything else unless you end up left behind for lack of faith. Wow.! Thank you for the quick response. I am a very strong believer and have little fear of being Left Behind, I’m not perfect lol and I do get worried sometimes, but I just want to be sure I’m aware enough to not take that mark, if it happens before the rapture. This was a great article by the way and I am going to share it on Facebook. Thank you for all your research and taking the time to share it with us… for free And not trying to make a profit off of what God has revealed to you . God Bless!! Peace be with you, I wish this articles where also available in spanish. Why do you say it’s not necessary to read the Bible about how to love. The Bible renews or mind and builds our faith. It tells us how to love by telling people the truth. An adulterous person is destined to hell unless they repent. The ultimate form of love is helping someone turn from sin. Sometimes the Bible instructs us to use tough love which may not look like love at all but necessary for correcting a person. Praying for our enemies is the toughest thing to do but also a form of love. People do not know how to love God’s way unless they are instructed. Cindy, if the Bible was “necessary to tell us how to love” then where does that leave the majority of humanity in history and today who do not know this special purpose you do or have access to a Bible? I think your concept of the purpose and necessity of Bible needs revision. First I would like to thank you Tim for sharing with all your insight. I believe that so often we don’t show a thankful attitude, instead we make it a mission in attempting to point out what we think is anothers inaccuracies. I am a student of life, I am constantly evolving and learning. I found your article very informative, thank you again for your insight….however it leaves me with an unanswered question that I have tried without success to solve for a while now. The 144,000. I believe that it is a literal number – for the most part, but then I am left wonder whether or not it is also as a reference? My reason is that when we talk about receiving the ‘mark of protection’ (please correct me if I’m wrong) the Angel’s are to ‘mark’ 144,000 from each of the 12 Tribes, this ends up being 1,728,000. Please, help me understand this. It’s 144,000 from 12 tribes (144000 / 12), not 144,000 from each tribe (144000 x 12). Dear Tim I salute you in Jesus Christ name our savior. I want to thank you for been a light unto the world. Many think with their mind but lack wisdom in their hearts and spirit due to lack of faith. You are a true leader of our Lord in heaven. I am proud of you for explaining the Holy Gospel and bringing out the good news of our savior. We all are children of our creator and truly Love and Faith are the basics of eternal salvation . Many worry about things of this world and seem lost in confusion. All we need is to love and worship God with all our hearts and mind. By been compassionate with one another helping ourselves everyday. Forgiven all our faults by living as bothers and sisters in piece and harmony. I pray for you and everybody that loves our Lord. God bless you always. Rejoice in heaven. Are you saying that “The Women” and the 144,000 are protected from the locusts of Revelation 9 but all other believers who did not escape to the wilderness will be tortured by the Locusts because they do not have the seal of God on their foreheads yet? Julie, exactly. If you are among those protects (144,000 everywhere or the Woman in one place) then you will be tormented by the locusts into taking the mark of the beast or choosing martyrdom. I always enjoy reading your articles….they challenge me to think and do more research. We may have to agree to disagree on your interpretation of who the “woman” is. I believe The “woman” is Mary and then later represents the people Mary comes from, Israel. This was made very clear to me by reading Jospeh’s dream in Genesis 37. This should open your eyes to a JEWISH interpretation. She (Mary) was with child, being obviously Jesus., and gave birth to a son, obviously Mary bearing Jesus. And then when you get to Rev 12:6….”and the WOMAN fled into the wilderness where she was protected for 1260days….” there is a change. This now can’t be literal Mary, so here it is to be interpreted as the people Mary represents- Israel. This has nothing to do with gentiles or the church. Your basis for making it be that in my opinion is a stretch in order to support what you believe. In my opinion, I believe it was done in error. Where then is the Church you ask? I believe they are gone, raptured, and probably at the Bema Seat of Judgement receiving their just rewards, if any. Anyhow, I didn’t say my interpretation is the RIGHT one….it might not be, but it is the best one I have for now. Always searching, always reading. If you think the church is in heaven at the start of Revelation, then you will miss all the places the saints are indicated plainly like the Woman = “those who keep the commands of God and have the faith of Jesus.” Those aren’t Jews or Gentiles; they are saints coming out of both Jews and Gentiles, not limited to Israel although righteous family of Israel was the template from Joseph’s dream of the sun, moon and 12 stars. But we agree more than you think. We agree on the Woman changing who it represents in heaven and then on earth. Mary, Israel. We diverge when you limit the Woman to only Israel instead of seeing that God uses Israel for a model but is not a “respecter of persons” (Acts 10:34) but will save “ALL who call upon his name” in the end times (Joel 2:32). Yes, we agree the Woman is not sealed with protection! If you are in a place Satan himself cannot reach, then no locusts can either. Hence, no need for this seal of protection as the entire place prepared is protected from ALL evil attacks as the text plainly says. To be honest, I don’t think I’ve thrown myself completely in one camp because I am always reading the scriptures through different filters -pre trip, pre wrath, post trib, and mid trib, and I’ve been known to lean different ways. And I read lots of books, like yours, to see why people believe what they believe. So, I am definitely not closed minded, just cautious in my interpreting of the Holy Word. Over my 30+ years in studying Bible prophecy, I have found so many good points in all these doctrines. But yes, as of today, I probably do lean more toward a pre trib rapture perspective because I see Daniels 70 weeks of prophecy being meant only for ISRAEL, NOT THE CHURCH. Doesn’t Jeremiah 30-31 call it “the time of Jacobs trouble?” So why include the church? In addition, I think the church may be the restrainer that is holding the antichrist back from doing his thing. And lastly for now, I believe God Promised we would not experience HIS WRATH which begins when Jesus opens the book and breaks the seals open. I just can’t buy your explanation that all faithful Christians will be airlifted to somewhere in Jordan. That seems absurd to me with far to many holes for my liking. I believe the post trib’s greatest scripture verse is Matt 24: 29-31, “immediately AFTER THE TRIBULATION of those days…..and then the sign of the Son of Man will appear….” can be simply explained……. Very simply, I don’t see this as the rapture but rather the second coming of Christ to come down and clean things up before he begins his Millenial Rule on Earth. Well, anyhow, I’ve said enough. I appreciate any words you have in rebuttal and I always consider them prayerfully. Like I said, I’m not trying to win an argument; I’m merely trying to be challenged to consider perspectives I may have missed. I always read your articles over and over so know that I am listening. And thank you for your love for the Lord, His Word, and for the sheep. Blessings going out your way my brother in Christ. Paul, there is an answer for all the pretrib passages since none of them talk about the “rapture before the Tribulation” explicitly but all require a predetermined concept of there being a pretrib rapture before leveraging the passage for thin support of the idea. The time of Jacob’s trouble passage is misquoted by you and by most. It says it’s the time of “EVEN Jacob’s trouble.” It’s a time so bad it affects even Jacob, not only Jacob. It’s referring to God’s wrath, not even the Great Tribulation (Jer 30:6-7=Isa 13:6-9). Try out Ephesians 1-13 .
beheading is the quickest least paianful manner by which ot be executed. He’ll not suffer for even one of his to be lost 1 foot from the finish line, the prize, the safe harbor, our Mansion in his Kingdom. Please give us your take on ths Tim. Now is not the time to be P.C.